I hope you have all enjoyed a peaceful Christmas with your families and are ready to face the New Year with lots of inspiration and enthusiasm. I don’t have any creations to show you today. Instead as I have had some requests on how to make the Trifold Angle Card, I thought I would provide my method for making this stunning card. I have provided both Imperial and Metric versions depending on the size of your cardstock. 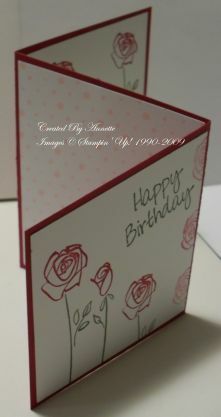 In either case, you will be able to get 2 cards from each piece of cardstock. Measure, cut and score according to the above diagram [click here to download measurements in pdf format]. I then cut a piece of white or vanilla to the same size, and cut it out into 3 pieces to leave a small border around the edges of the main card [usually about 5mm or 3/16″]. I then decorate the front [first] and third pieces and leave the second fairly plain so allowing you room to write. 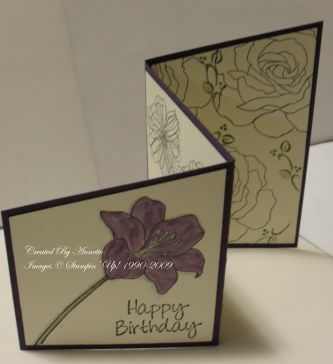 Sometimes, I will also cut a piece of the white or vanilla [see Trifold Angle Elegant 5th Avenue] or Designer Series Paper [see Trifold Angle Pomegranate Blossoms] for the ‘back’ of the front piece. Please leave me a comment if you would like further information. If you alter the measurements to 2 3/4″ by 5 3/4″, it should then just fit into your medium envelope. You may need to adjust these slightly. Hi! Loved this fold with the Morning Cup set! Would lve to do something similar for my next S-A-S! I made the card, but can’t seem to find an envelope to put it in! Any suggestions? I remeasured, I hope I didn’t make any mistake! Thank you for your time!! Thanks so much for sharing your instructional template! Can’t wait to try it! I love your design Charlene. Thanks for giving me credit on your beautiful blog. This was a fun card to make. Thanks for the inspiration! Thanks for sharing. Great card idea!!! Thanks for the free download of the triangle fold card! Annette, Thank you for your prompt reply. I have printed the directions, which look really simple, and I am off to design my Christmas card for this year! Thanks for the great idea. My sister-in-law is going to love this one too.